Never seen before. Never seen again. An exhibition unlike any other, paying homage to the most prolific scorers of our generations. Witness the greatest compilation of milestone artifacts and rare personal memorabilia, all hand-picked by Hockey Hall of Fame curators from the Howe and Gretzky family collections. Revel in the legacy and indelible bond of ‘Mr. Hockey’ and ‘The Great One’. Thanks for sharing the events. http://www.emeraldcutengagmentrings.com/emerald-cut-diamonds/a-brief-comparison-between-a-radiant-and-emerald-cut-diamond/ This post is very relevant is useful. 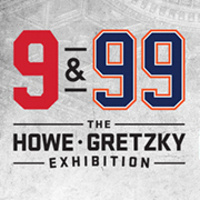 Happy to know about The Howe - Gretzky Exhibition. 9 & 99 is doing a great job. I love Hockey very much. I'm so much excited to watch it. If you have got a home theater to be installed, we have got the services to please you. Available at your service right at a call, we have expertise in home theater installation the way clients want. The USPS Is a government agency which is overseen by a board of nine governors who are appointed the president in charge of providing mail services in the United States. wow! Great event, I love to have a ticket on this. really awesome post for such type of help I really get it more Information.